Greenbelt Community Center (formerly a school). When the planned community of Greenbelt opened in 1937, all of the town's religious communities worshipped in this art deco building. Greenbelt, Maryland, was the first of three greenbelt towns built by President Franklin D. Roosevelt's administration during the New Deal. Greenbelt was intended to provide moderate-income public housing and to serve as an experiment in planned communities. The town was designed to encourage family life through a pedestrian-oriented layout (with inner walkways and parks) and central, community-owned businesses. Greenbelt opened in 1937 and attracted much attention from the American press, in part because of its unusual religious life. The town's residents had been selected through a quota system that was intended to give variety to the new community; one of the quotas ensured religious diversity. Because Greenbelt was owned by the United States government, no houses of worship were built; however, tracts of land were set aside that were later bought by the town's religious communities as locations for their buildings. The earliest residents all worshipped in the school building, which also served as a community center. Because the town's population was small at first, Greenbelt's Protestants joined together to form a single community church. Before long, the town's Protestants, Catholics, Jews, and Mormons were cooperating on interfaith projects. Although Greenbelt was sold by the United States government in the early fifties, its interfaith tradition has continued. Through the Greenbelt Clergy Association, leaders from the Bahá'í, Christian, and Jewish communities cooperate in community matters. When Greenbelt's Jewish Community Center was built in 1952, local church members helped with the construction; when Greenbelt's Catholic school burned in 1988, its classes were temporarily moved to that same community center. Every year, Greenbelters hold an ecumenical Easter service and an interfaith Thanksgiving service, and every year, members of the Clergy Association march in union at the Greenbelt Labor Day parade. The cover of the first issue of Greenbelt Interfaith News. 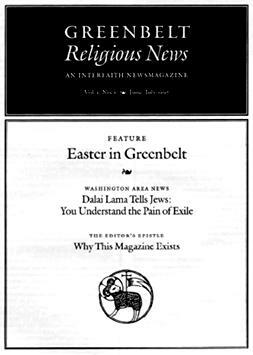 Greenbelt Interfaith News was begun as an independent supplement to the local newspaper, which usually does not publish religion news articles. Helped by the cooperation of the local religious communities, the magazine published its first issue on June 1, 1997, the sixtieth anniversary of Greenbelt's charter. From the beginning, Greenbelt Interfaith News carried national and international news. When it moved to the Web on August 20, 1997, the magazine expanded its coverage of U.S. and world news, as well as its coverage of important religious events occuring in the Washington area. Today, Greenbelt Interfaith News has two missions: to cover interfaith news from around the world, especially news of faiths that are less well known in the U.S., and to cover news of religious archaeology. Although our readership is now international, we have not forgotten our roots; Greenbelt Interfaith News continues to post a directory of faith communities in the Greenbelt area. Without the initial assistance of Greenbelt's interfaith community, Greenbelt Interfaith News would not exist today.